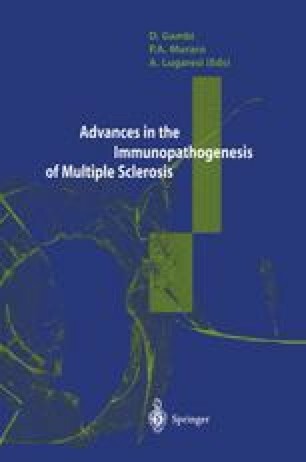 In multiple sclerosis (MS), as well as in other putatively T cell mediated diseases, much attention has been devoted to possible dysregulations at the level of the adaptive immune response, with particular emphasis on the search for potential T lymphocyte autoantigens. These investigations have been, in many cases, unrewarding. One reason may be that T cells are not the key players in self-nonself discrimination: T cell receptors (TCR) have randomly generated specificities that, for this reason, cannot determine the origin and biological context of their ligands . It is becoming increasingly evident that this task is better carried out by the innate immune system that relies on germline-encoded receptors which bind to invariant molecules shared by large groups of microorganisms. These structures (techoic acids, lipopolysaccharides (LPS), double-stranded RNA, mannans) are therefore readily recognized as markers of infection by the innate immune system that instructs the adaptive response accordingly . Based on this evidence, it is now clear that the correct functioning of innate and adaptive immunity as well as their balanced interaction are essential for a physiological immune response . This has prompted much of the recent research focused on the interface between these two arms of the immune system in autoimmunity.